Tri-Counties Regional Center embraces a culture of shared learning and continuous improvement through high quality learning opportunities for employees, service providers, community partners and individuals and families receiving services and supports. In addition TCRC annually offers supplemental training ranging from Working with the Courts to Trauma to Person Centered Planning. TCRC does offer courses (not all courses are eligible) that qualify for continuing education units (CEUs). Person Centered Practice – The keystone of our culture. 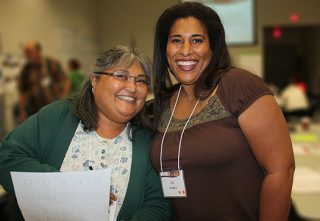 Over the past decade TCRC has continued work on a broad training initiative to build capacity for person centered practices. This multi-year plan includes training staff, service providers, families and adults served and other interested community members. An introduction to Person Centered Thinking (PCT) is required of all new staff and reinforced through modeling and coaching support from managers. Person centered learning is reinforced through meetings called Communities of Practice (COP). COP is regularly offered in each regional location to augment PCT training and build confidence in using the skills and tools taught. Additional PCT training opportunities are available to all stakeholders to help embed person centered skills and practices in their daily work and life. For more information about Person Centered Thinking and training offered click here.